MICHAEL VAN GERWEN led the charge with a breath-taking performance on the opening night of the Unibet European Championship as five MODUS aces won through to the second round with victories in Dortmund on Thursday evening. LUKE HUMPHRIES ensured a return to Alexandra Palace for the 2018/19 William Hill World Darts Championship after a brilliant run in the final Players Championship event of the year. 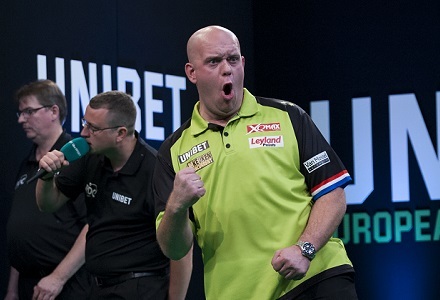 MICHAEL VAN GERWEN signed off in style as far as the 2018 PDC European Tour season was concerned – as the dominant Dutchman landed a 170 checkout to complete his eighth triumph of this year’s campaign. ELEVEN MODUS stars will compete in the final PDC European Tour event of 2018 when the European Darts Trophy gets underway in Göttingen on Friday.